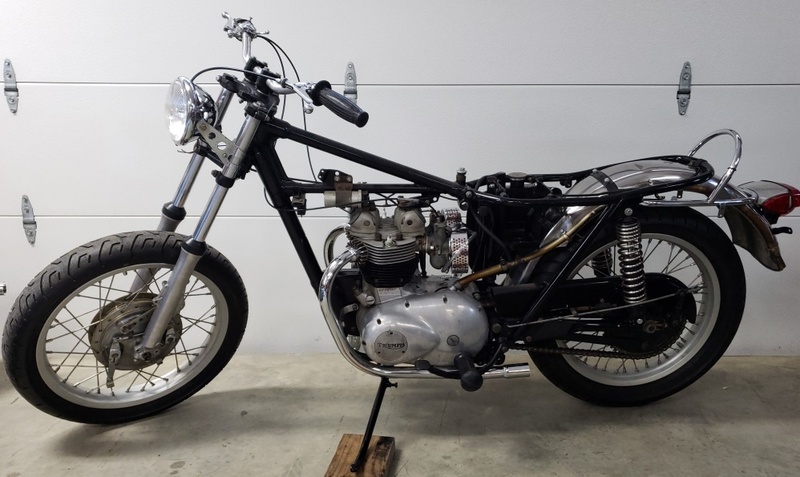 March 17, 2019 A customer got a really good deal on a 1970 Triumph Daytona (500cc T100R) and had it delivered to me to get it on the road. From the pictures and description, it seemed like it only needed wiring, cables and a few other things. It turns out that it needs more than that, but it still is an excellent deal. It appeared from those pictures that the front wheel was installed backwards. Actually the forks are on the wrong sides and more importantly, they are not Triumph and not even British. The owner would like a disc brake. I have a selection of front end parts. 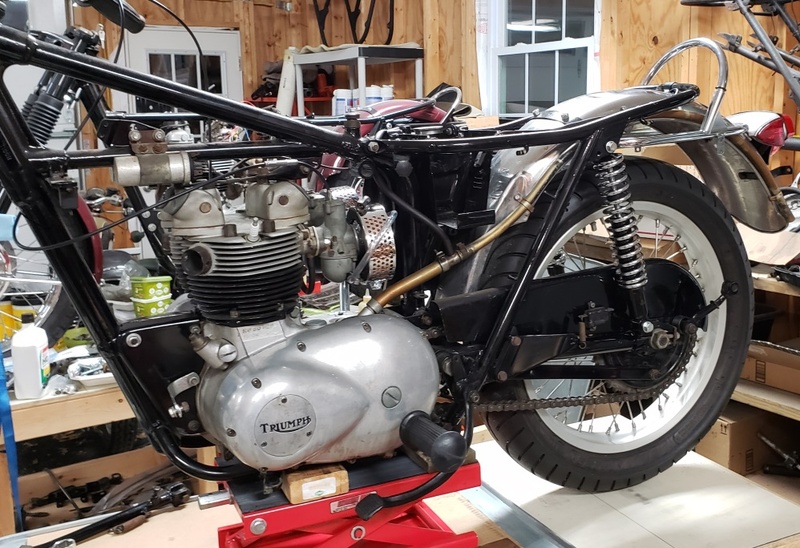 If I have enough parts to make sense, I'll install a Triumph disc front end, otherwise, a later Triumph drum front end. The Triumph 500s should always have the steel, black sliders, but he's not as worried about making it "right" as being able to ride and stop. The picture shows the bike with the tank, side cover and seat removed for safe keeping. First up, the rear end. The rear shocks had VERY heavy springs. I'm big and the springs didn't give when I sat on the bike. The owner is normal size and would be very uncomfortable with those shocks. The bolts were just stuck through the frame and shocks - no nuts! More importantly, notice the the rear brake rod is bent and rubbing on the bottom of the shock. That's because they are not the right shocks. Even more important than that, look at the second picture. The eye in each end of the shocks is way bigger than the 3/8" they are supposed to be. The third picture shows the new, correct shocks properly installed. I still have to straighten the brake rod and re-install it. 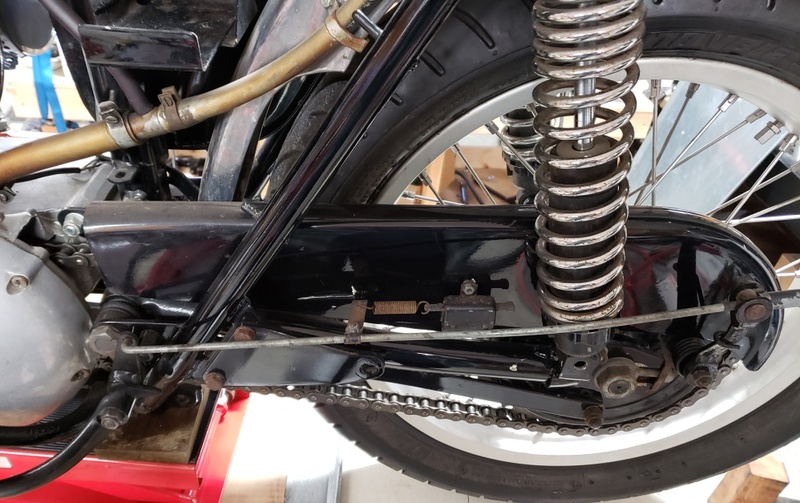 While working on the rear end, I noticed that the rear chain has almost no slack with the adjusters all the way forward - a new chain will probably be required. I started on the front end. I removed the front wheel and noticed in the process that the triple tree is VERY loose in the steering head. Fortunately, the bike was not ridable - that was a terrible tank slapper waiting to happen! 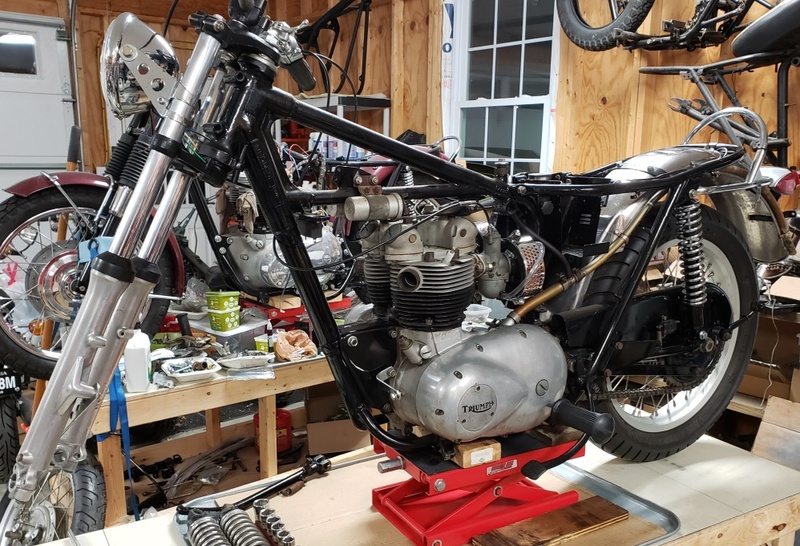 March 20, 2019 Finished taking the front end apart and investigated the idea of a Norton front end because I have most of the parts for that. I think it might work if I can find the right size bearings races or tapered roller bearings. Also investigated the oil tank. The bottom was leaning in way too much and was pushing on the rear fender (near the green arrow) and battery box. That's a recipe of disaster. Since the top mounts and the battery box mounts needed the rubbers changed I took the oil tank out. That's when I realized that the bottom mount was as homemade mess and installed backwards. I don't have one but I have one ordered. 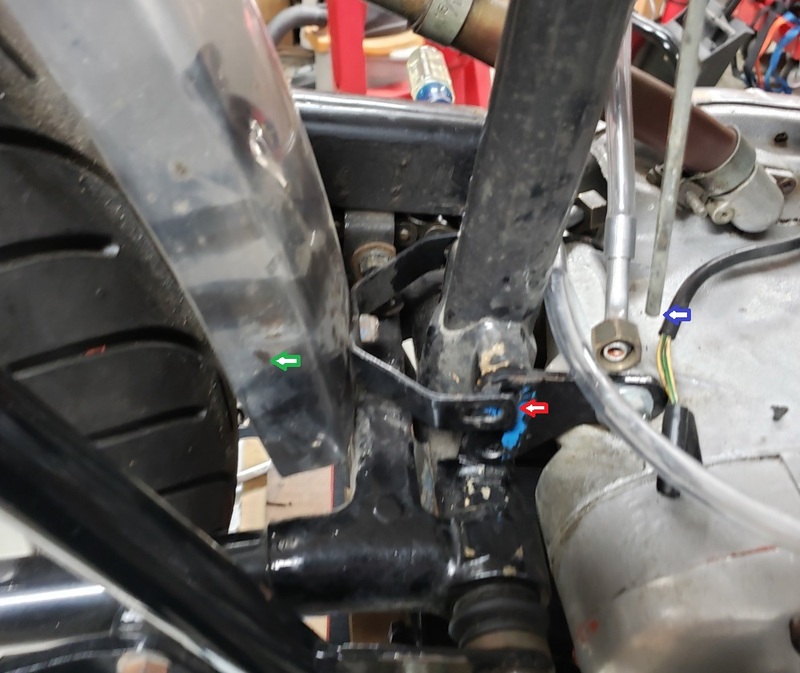 The red arrow shows where the mount goes and where two studs hold the rear motor mount. One of those studs was correct but the other was a metric bold instead of a stud. Fortunately, I have the right stud. As long as I'm there, I'll powder coat the mount. 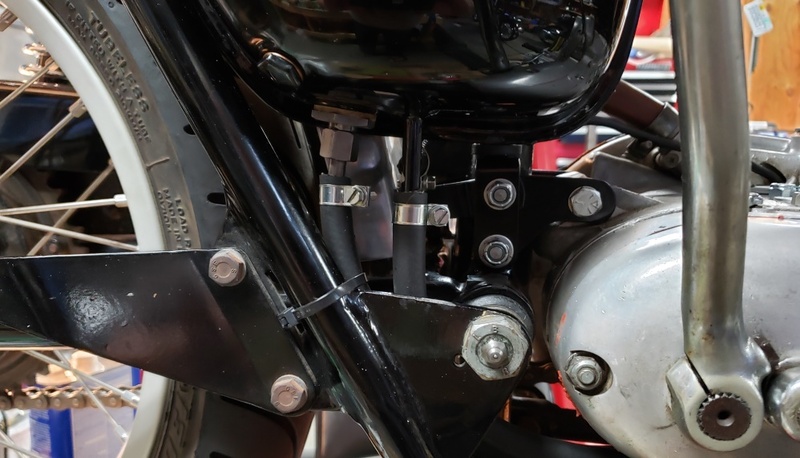 Another things that that was wrong at the red arrow is that the rear fender mount was in the bottom hole and too close to the swingarm - the top stud goes through. Notice the blue arrow. That's the rocker oil feed pipe. They are always sold too long and need to be properly routed and then cut to length. A short piece of rubber hose goes from that pipe to a pipe on the bottom of the oil tank. It should sit next to the frame pipe. It's terribly formed at the top and obviously wrong at the bottom - I thin it is savable. 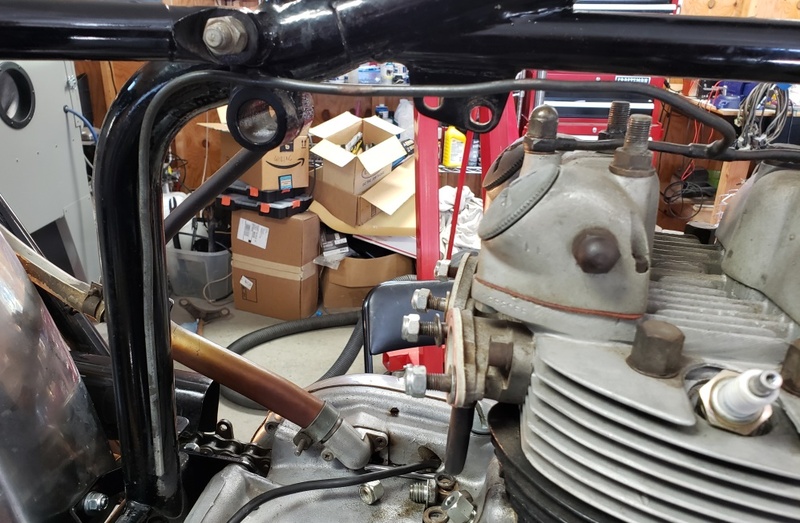 March 21, 2019 While waiting for parts I decided to take a look a the carbs. First up, take the brand new air cleaners off. They are beautiful, but one problem - they are for 900-series carbs, not 600-series carbs! Fortunately, I have lots of the correct inner parts so it's not a big deal. For the second bike in a row, we have an over tightener - I don't know why people over tighten! Then I tried to take the slides out - they would not come out. 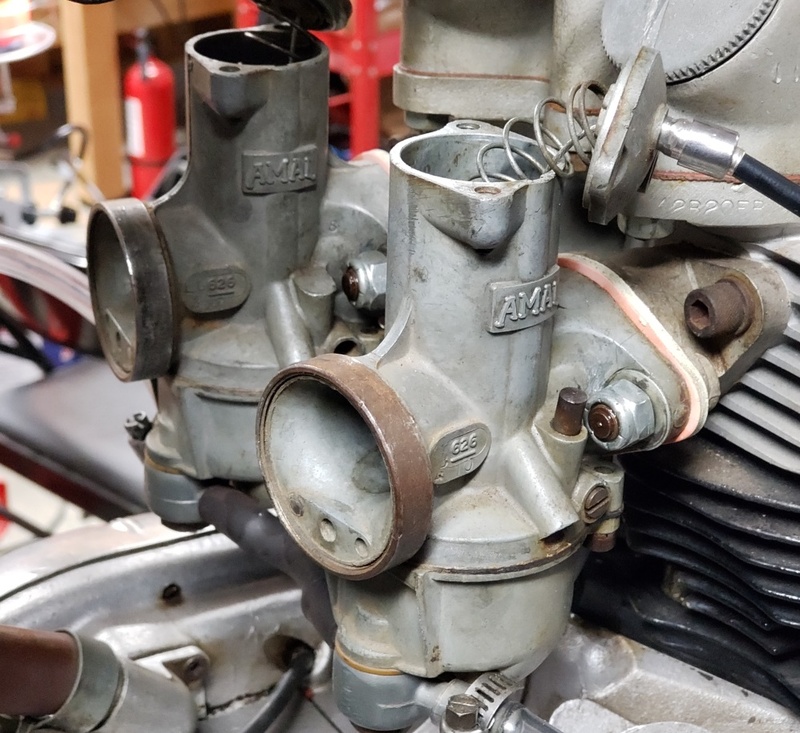 Over tightening anything on an Amal carb is a problem. These are destroyed - the tops were over tightened, the flanges were over tightened, and the bowls were over tightened! I thought the cables were in backwards - it turns out that both ends of the cables are carb ends - the throttle won't work that way! The twist grip is new and good quality but was missing the ferrules - fortunately, I have some. Decided to check the rocker clearances. All four had no gap at all! It was very difficult to get the nuts loose - they were very overtightened. Once I did, I had to take all four adjusters out and chase the threads. 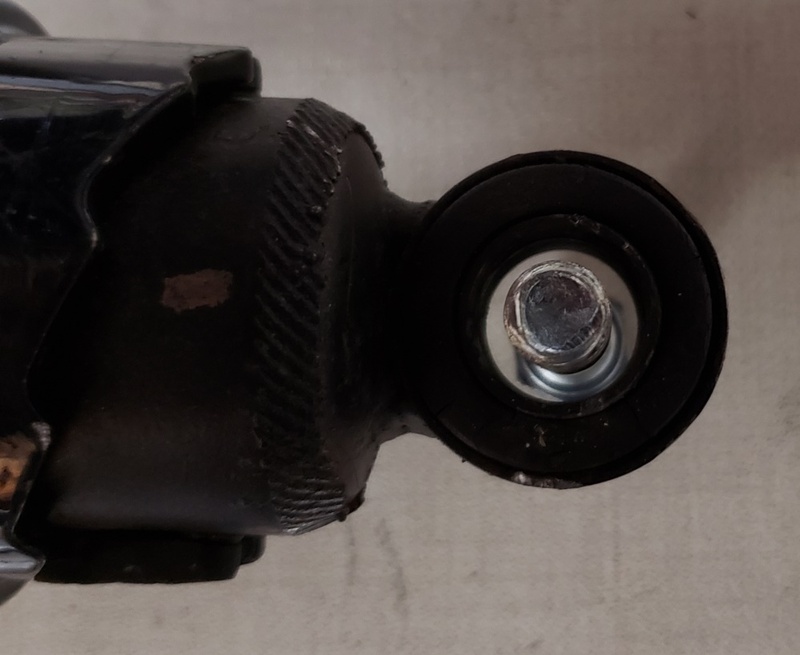 Fortunately, the threads in the rocker arms were OK.
March 26, 2019 Besides continuing to search for and buy parts, the work below to the next data was all down over the weekend, then I got busy on other things. Here the rocker feed has been reformed to run where it should. It's still too long, but the oil tank has to be installed and the hose conned to see how to run it and where to cut both the metal line and rubber hose. It's important that the rubber hose no be rubbing on anything. 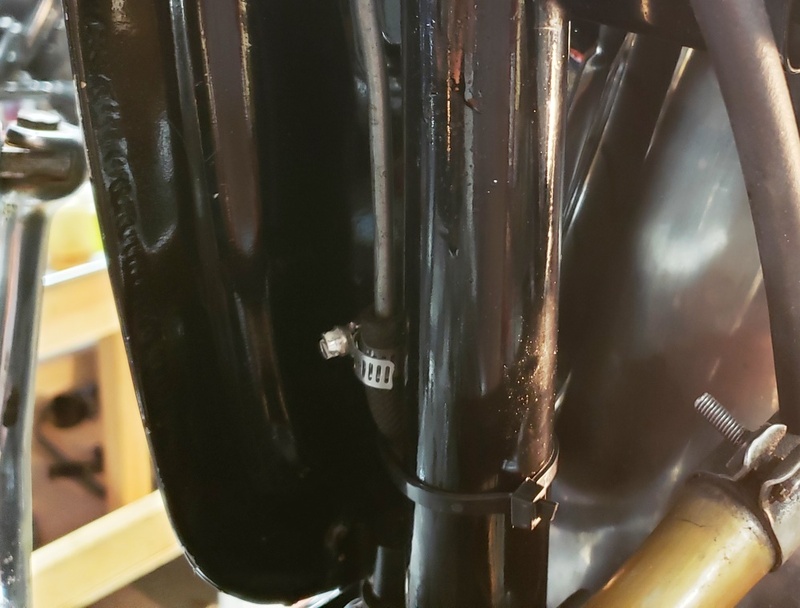 The engine and new bottom oil tank mount have been powder coated and installed, the oil tank is installed, and the hoses are all properly run. The rocker feed line has been shortened and the hose installed. The hose is tie wrapped to the frame so it cannot rub. You can't see it in this picture that that's the only place it touches the frame. The battery box is installed with all new grommets and the battery is in place. I have to be sure that the seat won't interfere with the battery. Many after market seat pan do not have the correct relief in that area. 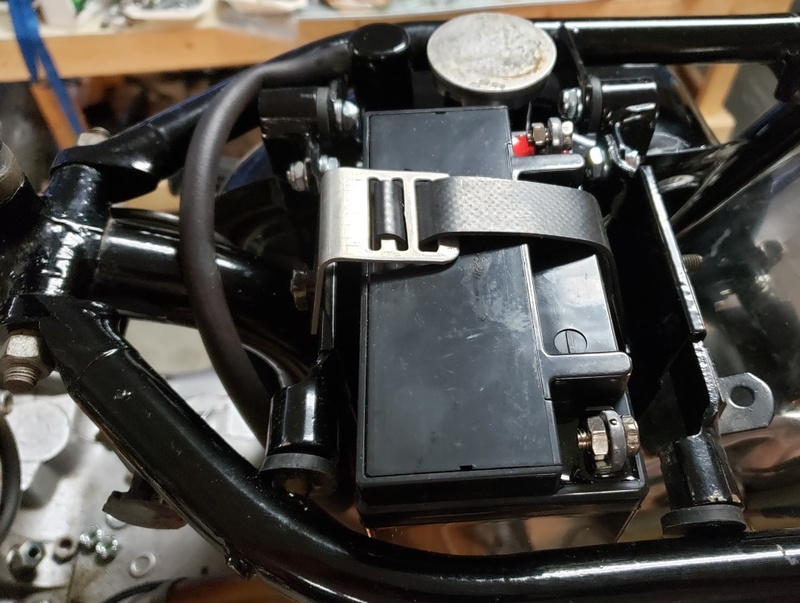 March 27, 2019 the oil pressure switch came in today and it fits. It's hard to tell if they will until you have them. This bike's timing cover is correct and has 3/8"-27npt (tapered) threads. Later covers had 3/8" unf threads and there's no way to tell which cover it has without removing it. 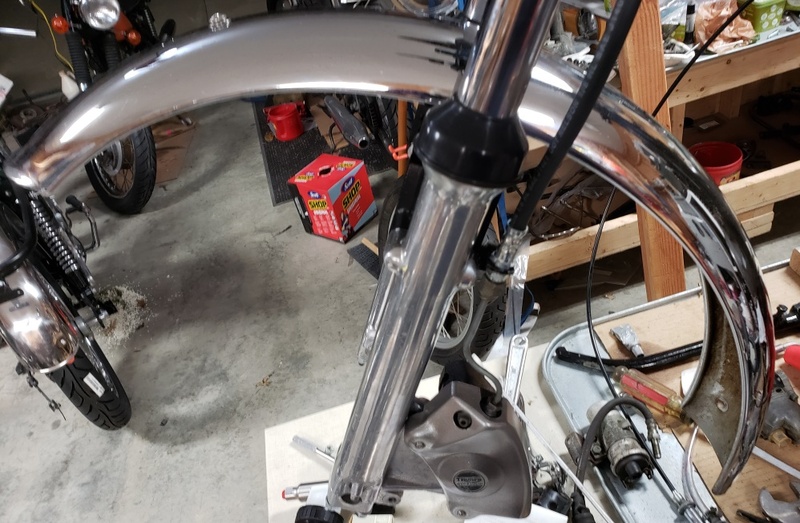 March 28, 2019 Straightened and cleaned the rear brake rod and realized there was another problem when I started to install it. The brake pedal would barely move. The assembly is supposed to be: brake pedal, spring washer, flat washer, locking nut. It was put together: washer, spring washer, brake pedal, washer, locking nut so the spring washer was completely crushed. Also, when the frame was painted so was the rusty pivot. The brake pedal had clearly been driven on and the locking nut was put on with red Loctite. So, a big wrench and a lot of heat was needed to get it off. Once apart, I blasted the pivot bolt and re-plated it. The I cleaned the rust out of the brake pedal, greased it, and properly assembled. Still need to restore the brake switch bracket, check the switch and replace if needed, and find a spring. 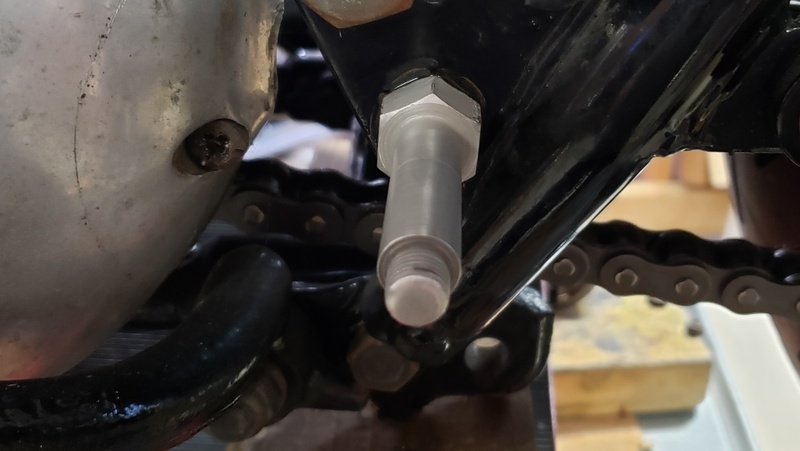 April 2, 2019 Found a completed T140V front end to install but soon realized that it uses tapered roller bearings and there is no size that works. Ordered a set that had a 0.025" too large an OD and planned to have them turned down. Then asked if anyone had done it on the TriumphRat forum. One guy made rings to use the standard bearings. Another told me to used a T150V bottom triple tree and everything would simply both together - how embarrassing, I should have known that! Anyway, I have a 74 T150V in boxes. The bottom triple tree was powder coated today. The top took forever to get the metalastic bushes out, but one done, I blasted and masked it for powder coating - that will be done tomorrow. Also cleaned and inspected the bearing races. on of the ones in the steering neck was wrong so I replaced that. I have new metalastic bushing coming and need to figure out what to do about the rusty chrome fork ears. I'l probably use mercuric acid to remove the chrome and powder coat them black. The forks I have seem to be good but I'll know for sure when I take them apart to clean and replace the seals. The caliper needs new pucks and I need a master cylinder and hoses. April 3, 2019 The triple tree is finished and installed. This time I took the top out of the oven and had the metalastic bushes in the freezer and they were still very hard to drive in! After installing, I started to install the steering lock when I realized that the locking lug has been cut off the frame. So, I'll have to find something to fill the hole - wish I had realized - I would have powder coated the inside. Started on the forks - they are in decent shape but I need new seals and o-rings. 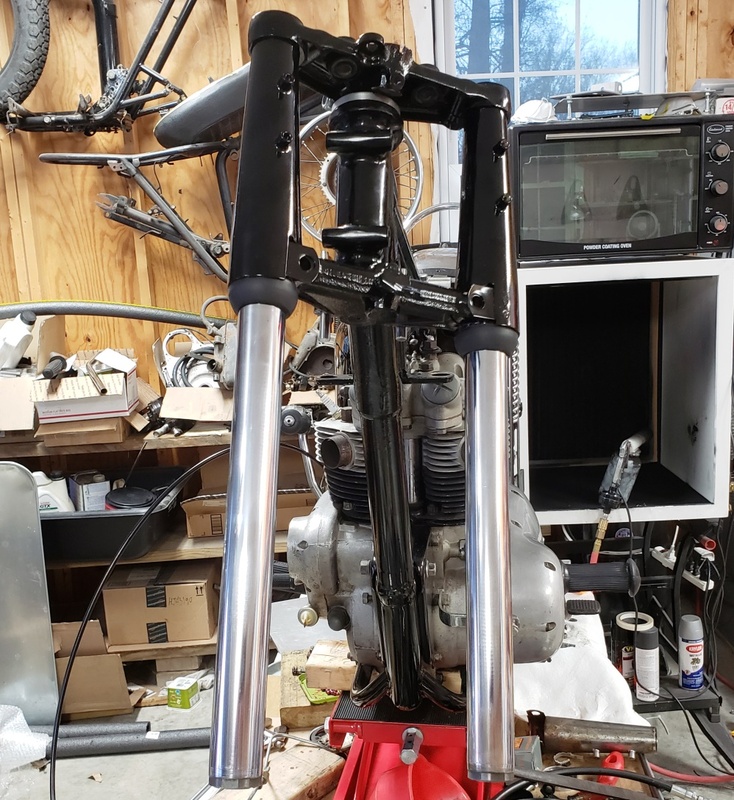 April 5, 2019 The T140 Forks are apart and inspected - they are in great shape and I have all the expendable parts ordered. The chrome portion of the T150 fork ears I'm using are quite rusty so I decided to powder coat them black - that will look correct for a 1970. The black portion of both sides were bent - I beat them back to straight and they will look prefect once powder coated. I cleaned the chrome portion in an acid bath, then sanded, and then sand blasted. That didn't actually remove the chrome but but got them smooth and rough enough for the powder coating to work. Then I coated them. The left one is great. For the first time ever, I didn't get good coverage on a part; so, the right needed to be redone. I tried just doing a second light coat - bad idea. It is a mess so I have to find something to strip them and do it again. The parts for the caliper are ordered and I'm looking for a master cylinder - I don't have one to rebuild. I have the front hub and disc, I have to figure out if I have a rim and spokes. April 6, 2019 Powder coat is VERY hard to remove. I went to Make Do Po this morning to get some strong stripper. They no longer sell it. Pep Boys still had the good (deadly) stuff for $17/quart but what could I do. It took five hours to softened it enough that I could get it off. Once clean, I sand blasted it again and it's now beautiful and installed. The rest of the fork parts are ready to go on, except for the seals which haven't come in yet. The actual fork ears ears are ready too, but I'm waiting for the rubber mounts to come in. 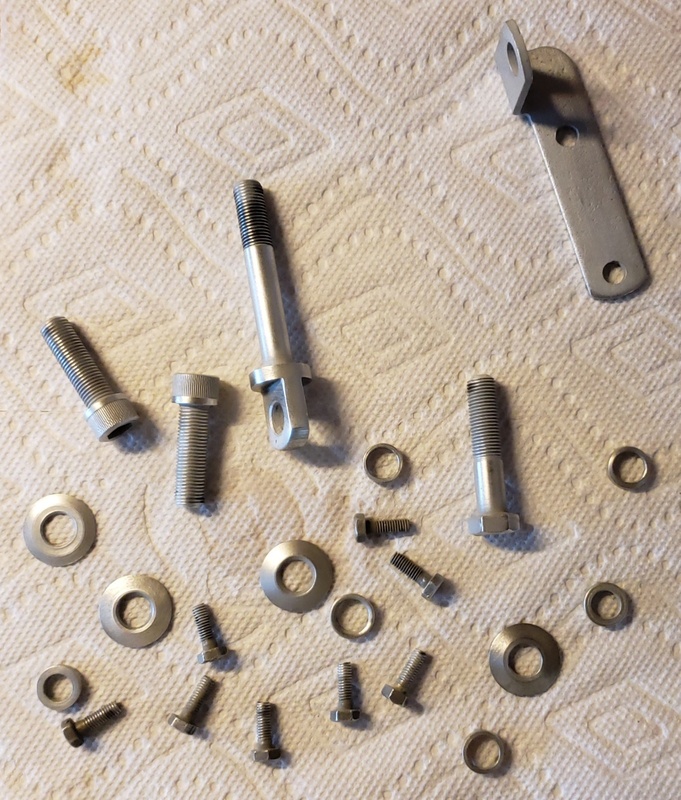 I sand blasted the various hardware for the forks and will re-plate them. I thought about powder coating them, especially the hydraulic hose brackets and might still once re-plated if they don't look good. The metal hydraulic lines were clogged as always happens when they sit around for years, but they cleaned up nice and I got them open and freely flowing so that will save some money. 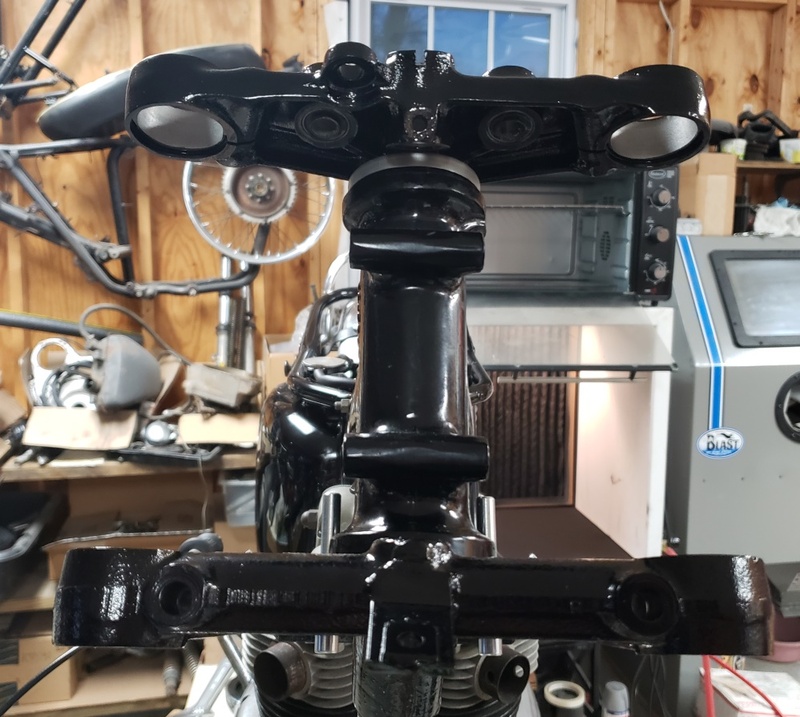 April 7, 2019 I've re-plated the small front end small parts I blasted yesterday. For any women reading, yes, I do use the kitchen sink! Think of it this way: the stainless steel sink is cleaner once I'm done than before I start! It takes a lot of time, but saves a lot of finding and paying for parts. The bracket at the top right was rust pitted and the pits show through the plating so I'll powder coat it. The little screws are from two front ends - only four are required but since I was doing it, I did all I have. They are very hard to find screws. The rings and conical washers are for the handlebar "P-Clamps" which rubber mount the handlebars. According to my inventory, I have the rubber parts to mount the fork ears - anyone know where I put them? 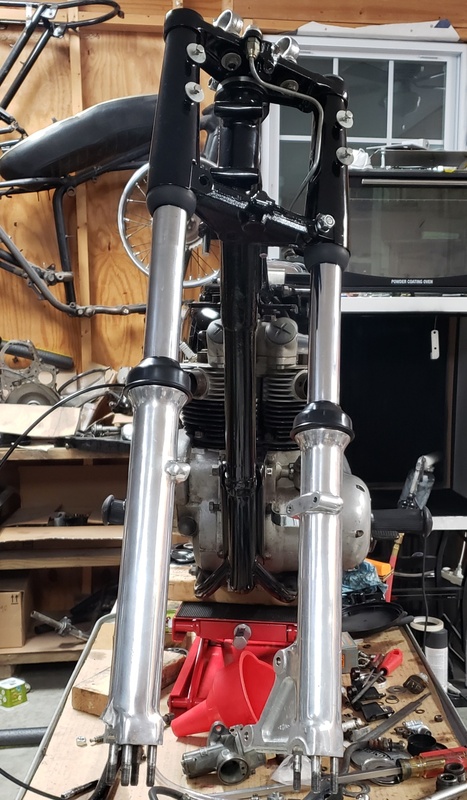 April 8, 2019 I still haven't found the rubber parts to mount the fork ears, but the seals an gaiters came in. The forks went together nicely and they work fine. The drain screws are a rusty mess so I've either got to find some or re-plate them. The rest of the parts for the P Clamps came in too, so I can mount the handle bars. I'm trying to get a deal on a rim and spokes to build the front wheel. I started on the caliper today. Still don't have a master cylinder - working on it. April 11, 2019 Lots of parts ordered and little things done. The new front rim and spokes arrived today. The new master cylinder and some small parts are arriving tomorrow. I bought a new caliper because the cost of the used one and the new stainless cylinder is a lot more than a complete new one. The front hub is apart. 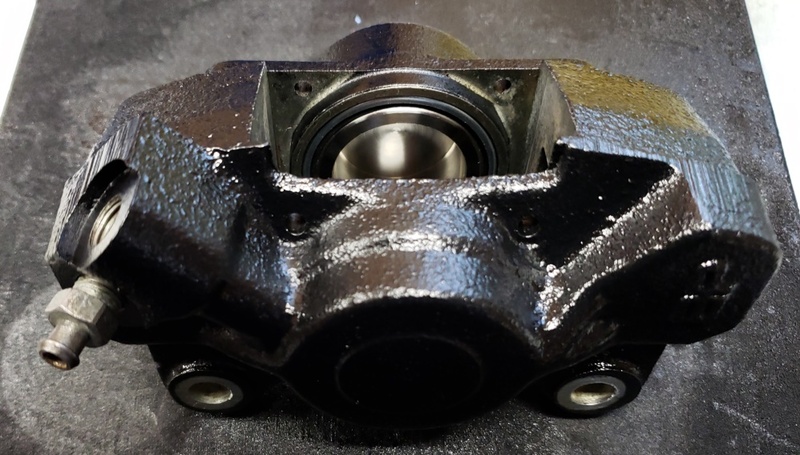 I have the bearings in stock, but the hub needed other attention. I was from a T140 and was painted with a wrinkle silver paint. About 80% looked good, but the paint was off the rest and the center seam leaked and it was full of muddy rust sludge from the bearings. So, I cleaned it and stripped the paint -- it was hard to get off! Since it was never polished, it has been hard to polish. One side it pretty good but the other side still needs a lot of hand sanding. While the paint remover was working, I started cleaning up the caliper. Internally, it is excellent. The outside is almost good enough to use as is, but I will paint it. Since I'm installing stainless steel pistons, there's no reason it will be apart again so a few extra minutes now makes sense. Hopefully tomorrow I'll have the hub polished and the caliper painted. Once the hub is done I can build the wheel. The only major things left after the wheel and caliper are the carbs, front fender and wiring. The front fender that went with the front end is in terrible condition so I need to find one. April 12, 2019 Several parts came in. The fork ears are mounted now. I've spent over four hours on the front hub - it will have to be good enough. The are made of cast aluminum and this one has a lot of small inclusions. 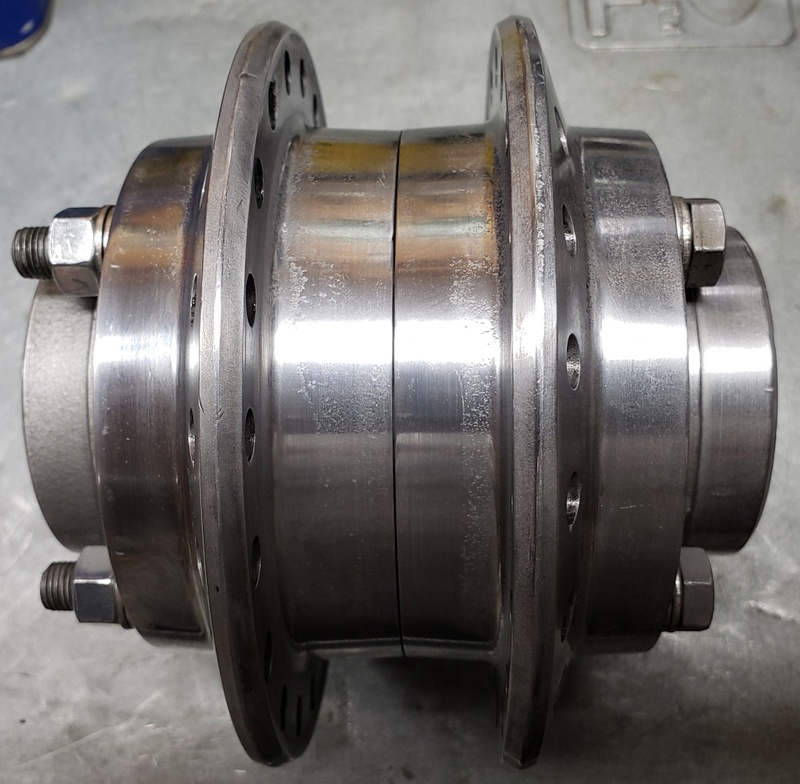 It's interesting that the T150 hubs were polished and the T140 were painted. Maybe they saved the better castings for the T150s and painted the others for the T140s. If I knew where to get paint like they used, I would consider painting them but the masking would be a PITA. I suspect that the originals were painted and then machined so masking was not needed. The picture is a closeup. From more of a distance, it looks pretty good. 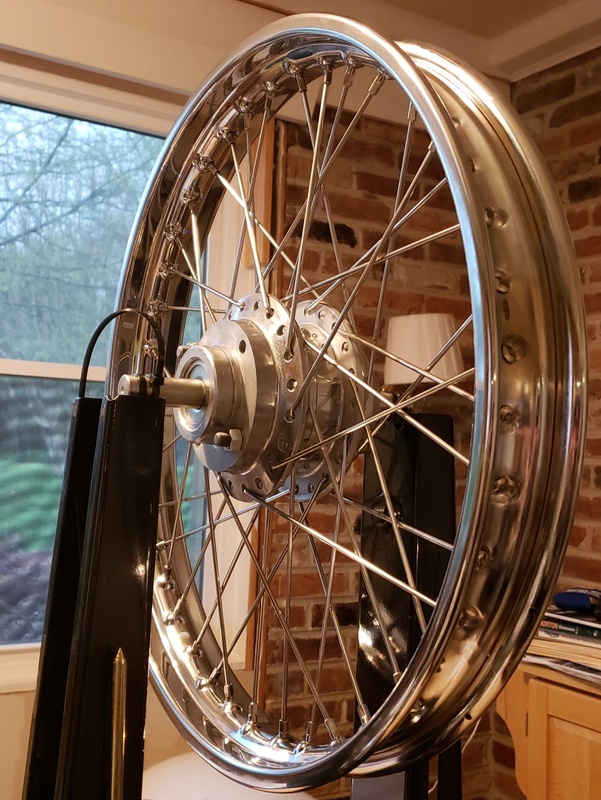 April 14, 2019 Tax weekend got in the way, but the front wheel is built and trued. Hopefully tomorrow I can mount the tire and balance the wheel. Still need to finish the caliper - it's been too humid to paint it. April 15, 2019 The hits keep coming! I planned to take the new tire from the front wheel that came with the bike and put it on the new rim - the tire is an 18". So, I've ordered a tire. I did mask and paint the caliper. I'll put it together with the new pistons and seals, re-mask and paint over the bolts that hold it together so it all looks fresh. I have a Triumph caliper cover that I powder coated with sparkle silver that I'll install - all the chrome ones I have are rusty. 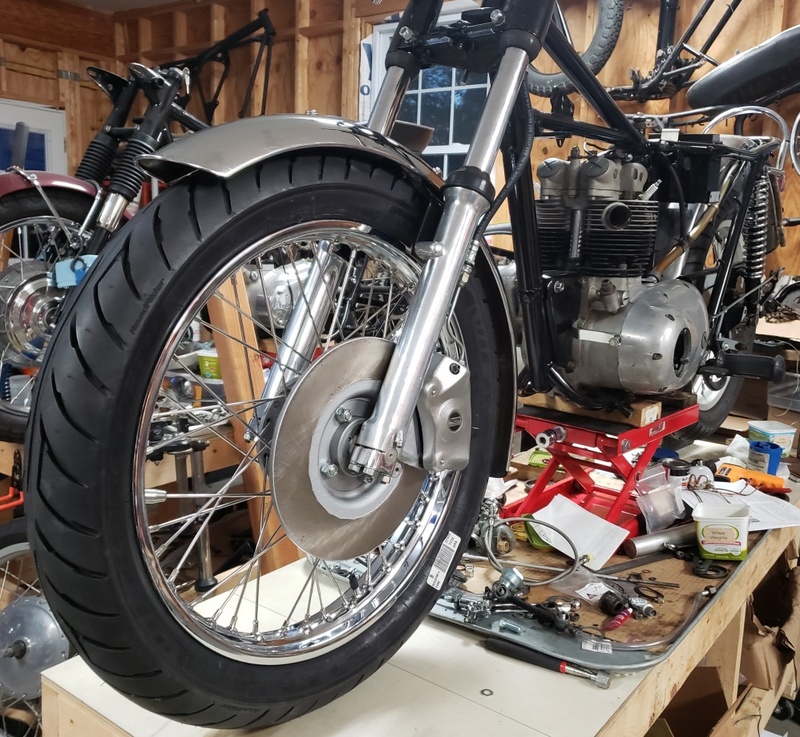 April 17, 2019 The caliper is done. The picture below is just before the pads were installed. The second picture shows the caliper installed and the fender too. The fender was a rusty mess with a big dent. I beat out the dent, used fine steel wool and WD40 to get rid of the rust, and then I used chrome polish. It's a long way from perfect, but looks good. I still have to figure out what to do about the rear fender stay. The tire came in and is mounted. I wanted to have wheel installed, but although I stored the disc carefully, it got some surface rust and I forgot that the center was not painted when I sent it to be turned so I have to work on that. New rim, spokes, and master cylinder. April 18, 2019 Cleaned up the disc and painted the center - it still has some discoloration, but that will go away as soon as it's used. Another first. The front hub wasn't as free on the axle and it should be and it was slightly binding. I took it apart twice before I figure it out. I was starting ot believe that the axle was bent but I triple checked it and could find nothing wrong. Then I thought the bearings were somehow going in the hub crooked, but I couldn's see how that was possible. Finally I rechecked the brand new bearings - the disc side bearing was bad! Fortunately I have a stock of those bearings so I put a new one in and it's working perfectly now. The wheel balanced with only one small weight. One of the bottom caps is cracked - a common occurrence. They can be used that way, but I don;t like it so I'm getting a new one. At least that won;t slow anything down. I tried to cleanup the bottom fender stay but the rust is too bad in one area. If I can't find one, I'll sand blast it and paint it silver like a Norton.